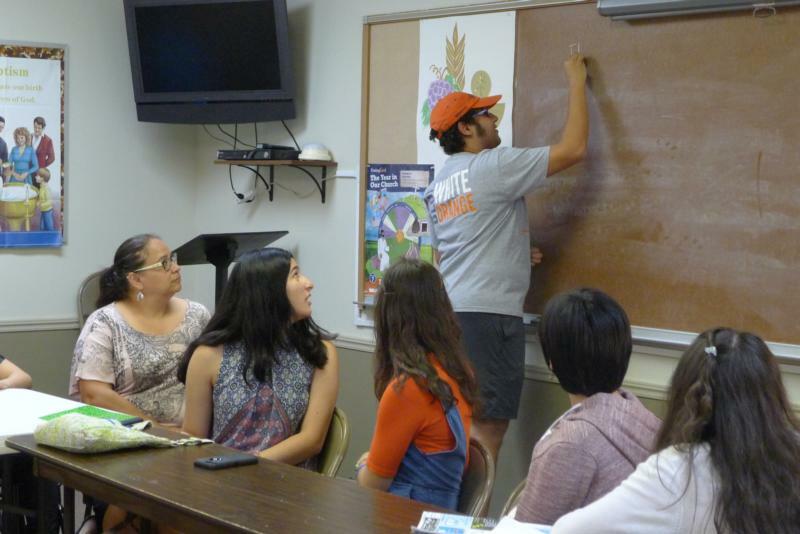 SAN ANTONIO (CNS) — Last summer, 25 teenagers at St. Brigid Church in San Antonio experienced their own “encuentro,” or encounter, and went out to meet people from different cultures. “We visited different rites of the Catholic Church and also experienced an encounter with a Muslim youth group,” said Blanca Valdillez, 15. Valdillez was one of 800 delegates who congregated in San Antonio April 13-15 for the Region X encuentro as part of preparations for the U.S. church’s “V Encuentro,” or Fifth National Encuentro, of Hispanic/Latino ministry. The U.S. bishops have called the four-year process of ecclesial reflection and action “a great opportunity for many parishes and dioceses to promote unity, leadership and cross-collaboration.” Reflection has taken place at the parish and diocesan levels and is now at the regional level — all leading up to the national encuentro in September. Attracted to that missionary call, Nora Ruiz, youth ministry coordinator at St. Brigid, adapted the parish version of the V Encuentro process to meet the needs of her group of multicultural teens, which include second- and third-generation Hispanic/Latino Catholics. The teens at St. Brigid spent a week visiting different churches, including a Greek Orthodox church and a Maronite Catholic church, as well as churches with a large population of Filipinos, Korean Catholics and Burmese refugees. Ruiz said that the teens followed the format of the “V Encuentro” books and its exercises. After going out to encounter others, they also would journal and share their experiences. In addition to seeing the diversity within the Catholic Church, the St. Brigid teens went to Toronto and did community service with a Muslim group. In addition to working together to give backpacks and school supplies to needy children, the Texas and Toronto group talked about their faiths and cultures. As part of the encuentro process, the St. Brigid’s youth group also connected with a Muslim youth group back in San Antonio. Ruiz was contacted by a young man who had learned about their Toronto trip and wanted to develop Catholic-Muslim community service groups. The Muslim and Catholic students made a pilgrimage to four of the five Spanish frontier missions in San Antonio, which gave them the chance to ask questions and listen to each other’s stories. “Like the disciples on the road to Emmaus, they encountered different people along the way,” said Ruiz, who has been trying to incorporate mission into her ministry for the past five years. Ruiz connected the St. Brigid youths’ experiences through their adapted parish encuentro to the conversations she, Valdillez and Pineriro had at the Region X encuentro in San Antonio. Valdillez said that even though she is already part of parish ministry, the encuentro inspired her to get even more involved and to reach out to the broader community. Ruiz said that the young people at St. Brigid will have a chance to continue the connections they formed with students from other churches and cultures. Plans call for members of the Muslim youth group “to come and experience our Mass and the kids would then experience their service,” Ruiz said. Future events also might include joint community service and something with a peace-through-dialogue focus.